Today we are going to create Ajax Login Form Using jQuery and PHP project. Before this project, we have created Ajax PHP Newsletter project using jQuery and PHP. Today our project is Login Form. We know that maximum top profile websites are using ajax for the various feature. Ajax is using for making a web page more attractive. Ajax complete actions without page loading. Let's see how to easily we can make a login page for our website. Follow instructions step by step. Now we are in the main point of creating Ajax Login Form. We are using Jquery, Ajax & PHP for making this login form. First, create a PHP file name as index.php and write down this code. We have added jQuery and Ajax evnts on this file. We have done ajax call in action.php file to do some login actions. Now we need to create action.php file, create action.php file and write your login functions. We have added a PHP functions for login. You can check and validate users by using MySQL but here I used a dummy login. You can added or eidt this file actions as you wish. We also added styles.css file for styling you can change it and add your own stylesheet, I have used styles from this site CSS. Our full project is ready to display result. Run this script into your server and check it. If you add all files correctly then Ajax Login Form will work properly. Here is a live demo of this project you can see this demo. Use Username: phpans and Password: phpans in demo version. 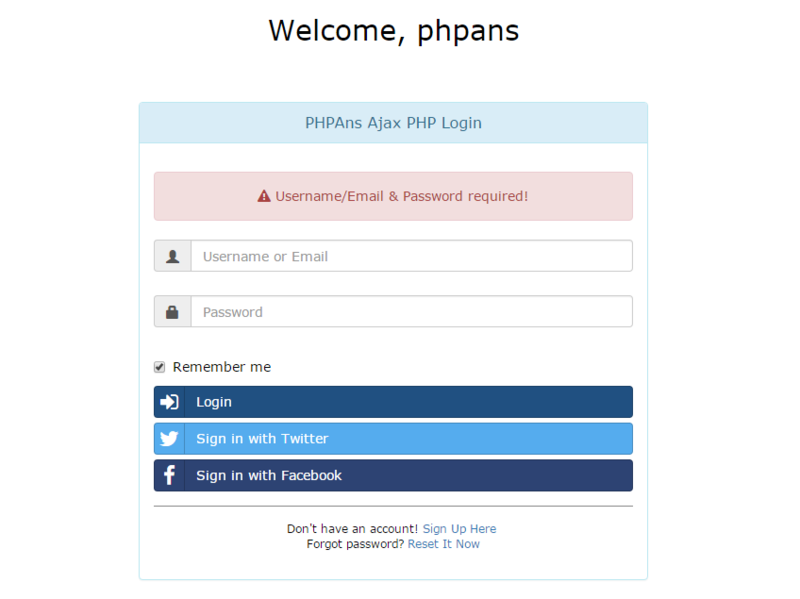 Even PHPAns are currently using this Ajax PHP project for Login to PHPAns. So, you can use this without any doubt make your website more attractive and present to your users. I hope you enjoy this project and this project will be helpful for you. And you can use this to increase site performance. I have added this file into attachment you can download full Ajax PHP Login project from here and you can use it instantly. In next project we will complete Ajax PHP Signup project. If you have any question or comment about this Ajax Login Form Using jQuery and PHP project please don't hesitate to do that, please comment your question in comment section.